Michael Phelps born on June 30, 1985 is an American swimmer and the most decorated Olympian of all times , with a total of 22 medals in three Olympiads. Phelps began swimming at the age of seven, partly because of the influence of his sisters and partly to provide him with an outlet for his energy. When Phelps was in the sixth grade, he was diagnosed with attention deficit hyperactivity disorder (ADHD). By the age of 10, he held a national record for his age group. 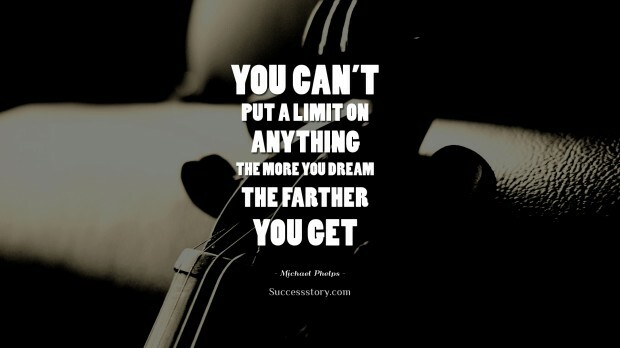 "You cant put a limit on anything.The more you dream the further you get"
His quotes are primarily to self encourage and boost oneself to enable accomplish the target goals set by a person for himself / herself. His quotes say that on your path so many people along the way for whatever it is you aspire to do, will tell you it can't be done. But it all it takes is imagination. Your dream, Your plan , and then only You shall reach your prospective Goal. There will be obstacles. There will be doubters. There will be mistakes. But with hard work, with belief, with confidence and trust in yourself and those around you, there are no limits. To make yourself believe in your own self and then work sincerely towards it will surely mean you will achieve your goals as he did not with a compulsion but by actually enjoying your task . The im program ( an initiative of Michael ) teaches children the importance of being active and healthy, with a focus on the sport of swimming. Quotes by Michael Phelps also promote the value of planning and goal-setting in life.